The 4th and last leg of “Food Tastings” for the year highlights easy yet delectable menu to help participants get their dining tables ready for the holidays. It is co-presented by Lifestyle and Shangri-La Plaza. Chef John will teach quick meat recipes at the exciting food fanfare. He is behind the successful JAM Foods & Co., the makers of the award-winning Angus beef tapa and other ready-to-cook premium items. Forget Me Not Specialty Cakes shop owner, Chef Pixie, meanwhile, will demonstrate easy-to-cook noodle recipes perfect for the Yuletide season through the Sapporo segment. Tefal’s resident chef, Deejay, will also share his own version of Pasta Paella Valenciana and Bbq Chicken Roll Ups, while Shangri-La Plaza’s La Creperie restaurant will prepare exciting sweet delicacies for the live cookfest. Aside from learning new recipes and cooking tips, the participants will get to try the best-tasting dishes freshly prepared by the guest culinary masters and be able to take home special giveaways. Food Magazine is the country’s largest selling culinary magazine published by ABS-CBN Publishing. It features the latest trends in food, kitchen-tested recipes, shopping tips, cooking techniques from experts and tips for foodies looking for their next gastronomic adventure. 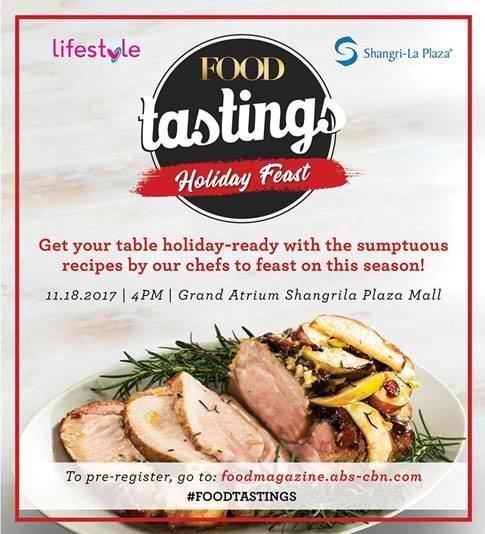 Join “Food Tastings: Holiday Feast” this Saturday, 4pm at the grand atrium of Shangri-La Plaza. Interested parties may pre-register online via foodmagazine.abs-cbn.com. For updates, follow Food Magazine on Facebook (facebook.com/foodmag) and Instagram (@foodmagazine).